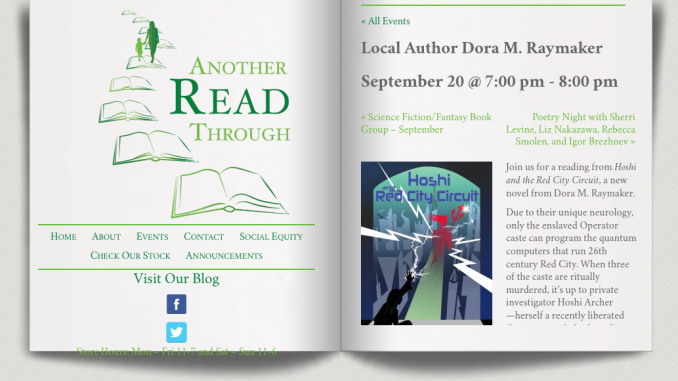 Join me at Another Read Through for a reading from my science fiction mystery novel Hoshi and the Red City Circuit, as well as conversation about my neurodivergent, disabled, and queer heroes; cool tech; systems science; and cantankerous detectives. I’ll have books available to sign and buy. Here are links to the venue’s FaceBook event and event calendar. Stop by and support a lovely local bookstore! Summer Reading: Melissa Scott, Steven King, Mercedes Lackey, me!